Through child sponsorship, you can change the world, one child at a time. NCM’s one-on-one child sponsorship program enables local churches to minister to nearly 12,000 children in more than 273 child development centers around the world. 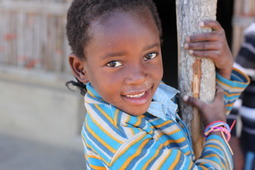 NCM’s child sponsorship program focuses on holistic child development, encouraging children to grow in all areas of their lives: physical, intellectual, emotional, relational, and spiritual. Your monthly support provides children with the opportunity to grow up healthy, receive an education, gain confidence and social skills, and develop spiritually. We encourage you to consider sponsoring a child. If you are unable to commit to an ongoing sponsorship, though, consider a one-time gift to support church-led child development ministries. Your gift will support ongoing ministries at child development centers and allow children who are still waiting for sponsors to be a part of a holistic child development program. Be sure to put ACM1851 in the Memo area. Thanks for your donation.